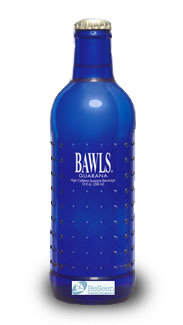 Made from guarana, a highly caffeinated berry native to the Amazonian rainforest, BAWLS Guarana seems to have acquired a cult following in the electronic gaming community, no doubt due in no small part to the fact that BAWLS is the largest sponsor of electronic gaming events with over 1,000 registered LAN groups. BAWLS averages 40 gaming events every weekend around the country, ranging in size from 30 to over 4,000 people. BAWLS Guarana is also the Official Soft Drink of the National Paintball League. The company even has a BAWLS military pack available to order. BAWLS Guaranexx is a sugar free version of the original. Bawls also makes two related products: SnoBAWLS, a blue, frozen, version of the highly caffeinated soft drink and fizzy sweet BAWLS Mints, also spiked with the same high-caffeine guarana that fuels the BAWLS drink, and likely the first candy that will keep you up all night.